We were on the toll way to DeKalb, picking up some car parts for Romy's 1970 Buick. Three or four times each way, to get to DeKalb from Chicago, you have to pay an 80 cent toll if you don't have the IPass sticker on your car. We don't have it because we rarely use the toll way. Well, digging in our money bag, I was searching for quarters, dimes, nickels, etc. when I came across some Kuwaiti money, or dinars. 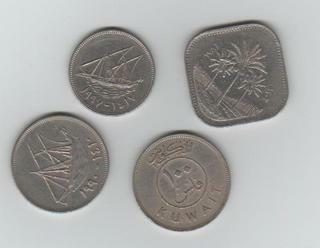 One coin was square shaped. Most of them had a Kuwaiti ship called a dhow on them. They are very very old. Romy must of dumped them in the sac. I thought I'd post the picture, because its kinda interesting!